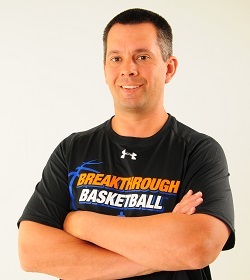 Jeff Haefner is a co-founder of Breakthrough Basketball, skill development trainer, and basketball coach in the Cedar Rapids Iowa area. He is a basketball junkie who loves the game of basketball -- whether he is playing, coaching, watching, or writing about it. Jeff has been very fortunate to coach basketball and train players at a number of different levels over the past 20 years. On a daily basis, he gets the opportunity to collaborate with, and learn from some of the best NBA, college, high school and youth coaches all across the country. He has viewed and studied thousands of articles, books, DVDs, and resources about basketball and player development. Jeff has written and developed hundreds of articles, books, videos, and instructional resources about coaching basketball. Over 200,0000 coaches around the world subscribe to and read the Breakthrough Basketball Newsletter that Jeff and his brother Joe publish. But what Jeff enjoys the most is teaching young players the fundamentals of basketball, how to gain confidence, and how to be successful in life. That is his passion! To him, practice is more fun than the games because that's where he gets the opportunity to teach and have a positive impact on young player's lives. Jeff graduated from the University of Northern Iowa with his Coaching Certificate and a Degree in Computer Science. Jeff grew up in Iowa and currently lives there today with his wife and two kids. In his spare time Jeff enjoys boating, water skiing, traveling to sunny places, working out, and playing with his kids as much he can!